Nestlé entered the mainstream UK formula market in December 2012 when it completed its takeover of the SMA brand. We are now seeing the aggressive marketing practices it uses around the world in the UK, driving down standards for the industry as a whole. It has recruited a network of Nestlé Nutrition Representatives and is holding events at hotels and other venues to bypass the restrictions many health facilities have on company representatives meeting with staff. Danone is using the same strategy. There is a lot you can do to prompt a debate about corporate sponsorship and conflicts of interest. See our poster on Health workers, conflicts of interest and the baby feeding industry and the ‘Say NO’ resources in our Virtual Shop. Or join one of Baby Milk Action’s protests outside a company-sponsored or organised event. Check the pages for Nestlé demonstrations and Danone demonstrations. 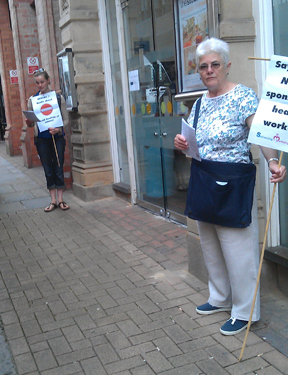 Even one or two people outside a venue is enough to get leaflets to most people attending. 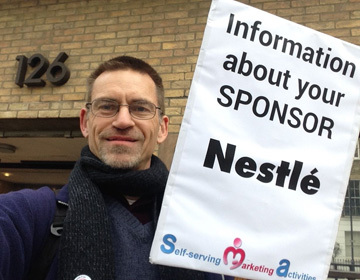 Below: Mike Brady leafleting at a Nestlé study on 20 November 2014 in London. Nestlé often uses prestigious venues, such as the Grand Connaught Rooms, London, shown below. Nestlé’s event on 15 July 2014 was ostensibly about ‘Managing the pre-term infant in the community’, with a Specialist Paediatric Dietitian as the ‘keynote lecturer’. Plus ‘refreshments’ and an ‘SMA Product update’ from the Nestlé nutrition representative. 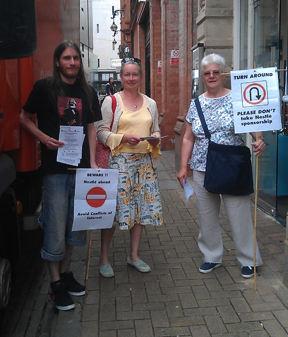 Baby Milk Action’s Campaigns Coordinator, Mike Brady, was joined by supporters Alex and Caroline to offer leaflets to participants as they arrived. ‘stimulate retail sales through the promotion of infant formulas and cereals to gain Healthcare Professionals recommendations’. There is a self-evident conflict of interest in companies with a vested interest in stimulating formula sales targeting health workers in this way. It’s not just Nestlé. 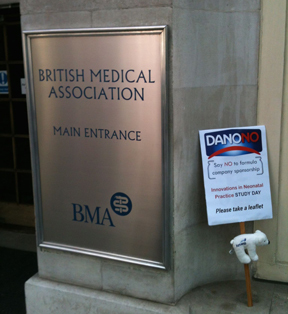 Mike leafleted at Danone’s study day held at the British Medical Association on 30 April 2014, and took the picture shown below. In a sign of how the more aggressive marketing environment is driving down standards, Hipp has also started offering study days – and we are organising protests. Join in if you can – it makes a difference. 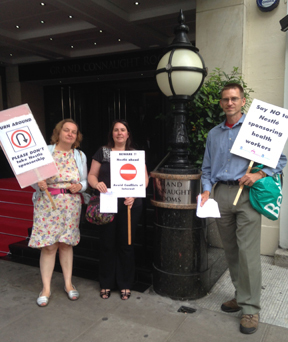 Following Nestlé’s first event in Histon, near Cambridge, student midwives attending from a nearby college discussed the issues with their colleagues and they decided not to attend any other company events. Hospitals have circulated messages to staff reminding them of their policy on not meeting with company reps. and informing them they will not be released in work time. So keep an eye on the Nestlé, Danone and Hipp demonstration pages for news of forthcoming protests. Here’s pictures from some other events. This event was ostensibly on food allergies. Nestlé’s new product launch in the UK is SMA HA, or hypoallergenic formula. It is not allowed to use this term in North America following legal action due to adverse reactions amongst infants with food allergies. When it attempted to launch Nan HA in the UK ten years ago, it had to attach warning labels saying not to use the formula with allergic infants. Thanks to Genevieve, Sue, James and Ali for helping to raise the need for health workers to have independent information. Another event linked to the launch of SMA HA. This had a guest speaking on Food hypersensitivity management in infants and pre-school children – alongside Nestlé’s Nutrition Representative. 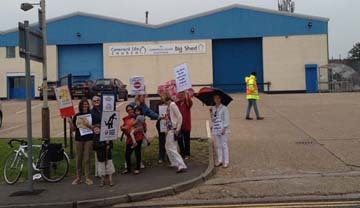 Thanks to Elisabeth and friends for trying to attract the attention of participants arriving at the event at the Big Shed.